Beads and beadwork have been an important part of the culture of southeast Africa for hundreds of years, perhaps for millennia. They have been used by archaeologists to date the ancient ruins of Mapungubwe and Zimbabwe, by historians to provide evidence of trading activities and contacts with other civilizations and cultures, and by anthropologists who have recognized Zulu beadwork as an important social regulator and index of status within the society. Curiously enough, however, Zulu beadwork, acknowledged to be among the finest in Africa, has received very little attention as an artistic expression. The Robert Hull Fleming Museum of the University of Vermont in Burlington has an outstanding collection of this beadwork which was the special province of the Zulu women, consisting of over 150 pieces collected by various donors from 1847 to circa 1910. A number of them can be pin-pointed as to geographic origin. The main sources of the collection are in the Transvaal, Natal and southern Mozambique. This geographic and time span allows for speculation about regional variations and stylistic developments. The bulk of the Fleming Museum's collection is composed of pieces made from modern beads of the late nineteenth and early twentieth centuries, although there are nearly two dozen older pieces. These older beads are not only the indigenous stone, ostrich shell, seed and wood beads, but also cowrie shells and glass beads imported by Arab traders from India, Persia, Arabia and the Far East, with most of the trade beads coming from Cambay. The Arabs monopolized the trade routes to East Africa until exploration by the Portuguese in the early sixteenth century opened up the area to European exploitation. The modem beads, brought by the Portuguese and English, were smaller, mass-produced and thus regular in size and shape (an advantage to the beadworker), and generally indistinguishable from one another. While the older beads were used to indicate one's wealth and status, the modem beads were available in plentiful quantities to anyone since they were used as specie by traders, settlers and missionaries. The oldest part of the collection was bequeathed to the University of Vermont by the Reverend Lewis Grout, an American Presbyterian missionary in Umsunduzi, Natal from 1847 to 1862. Generally, this section is representative of the ornaments of the Zulu prior to prolonged contact with Europeans; the pieces are probably at least several decades older than the collection dates of 1847-1862 since during this period, the new beads had already flooded Africa. The Grout ornaments are composed of teeth, bones, cowries, pith and brass as well as the large irregular beads which fell into disfavor as the imported ones became available. Most are strung on twisted vegetable fiber rather than on the imported cotton cord and linen string found in later pieces. pebbles and worn on the ankle as a noisemaker by young boys at dances (Fig. 3). A vegetable fiber string of little pith beads may be the amaka also described by him, where scented herbs are ground, kneaded and shaped into little balls and pierced with a thorn. The Grout collection also contains an example of the traditional cylindrical reed snuff container, often worn in a pierced ear. This particular container, however, consists of two reeds bound together by black and white bands of the fine modern beadwork. A string of the old, tapering, large wound glass cylinders in opaque white, blue and plum color on a white core is an example of still another type of beadwork from this varied collection. These plum colored or red-on-white beads, also called "slave beads," are among the most common older beads in the world, and existed in a variety of sizes in southeast Africa after 1800. In the Fleming Museum, they are most often found as fasteners in conjunction with a thread loop affixed to pieces composed largely of small modern beads-only in two examples are they an integral part of the piece. Two of the most dazzling ornaments in the Fleming Museum were acquired by Grout. Two long, beaded shoulder bands, 113 centimeters long, and a matching collar with a large pendant breast tab are worked in alternate red, blue and black triangles against a white beadwork ground while the neckband of the collar is worked in an intricate lace-like stringing technique (Fig. 8). The ensemble would have been an especially handsome dance or courtship attire for a young Zulu man. 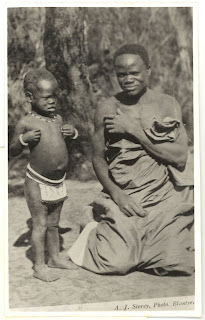 In 1934, Laura Buckham presented the Museum with some Zulu articles of considerable age. Among them were several pieces of beadwork which were recently discovered to have been collected by Miss Buckham's grandfather, Josiah Tyler, a Congregational missionary who was Grout's friend and neighbor in Natal; in fact, Tyler took over Grout's mission from 1862, when the latter returned to Vermont, until 1889. The several pieces of beadwork which Tyler obtained should be regarded as an extension of the Grout collection by virtue of collection date and locality. An interesting item in the Buckham/Tyler group is a rectangular bag made of thin pieces of hollow grass or reed tied together and lined with cotton cloth. It is decorated with occasional beadwork on the front, and has two long beaded strings attached, probably used to carry it around the neck. The use of grass contrasts with later examples of entirely beaded bags. Tyler also possessed a string of red seed beads alternating with tiny, hexagonal, black iridescent beads which seems to be an example of the traditional single-strand love beads, ucu lokuqoma, strung by a young Zulu girl for her first lover to wear around his neck. She had similar strands for her waist, wrists and ankles. This string marked the first stage of her love life and after this point she was allowed to wear any kind of beaded ornament to beautify herself. By far the largest part of the Museum's Zulu beadwork came from Mrs. Robert Catlin, whose husband was the General Manager for Consolidated Gold Mines at Johannesburg in the Transvaal from 1895 to 1906. The Catlins acquirednearly one hundred pieces of excellent beadwork, and their gift contains striking examples in almost every category. In a dazzling array of color and pattern, the superbly crafted pieces summarize the Zulu woman's gift for design and technique. A Zulu donned various types of beadwork corresponding to stages of development from childhood to adulthood; it functioned to order the progression of love from courtship to marriage. When a child began to crawl, a medicinal amulet- a special berry acting as a charm for good health-was replaced by a single string of beads, the ingeje (Fig. 4). Sometimes the child's string had tiny beaded tabs, one for little girls and two tabs, front and back, for boys. As the girlchild grew, her loin band became more elaborate with beaded fringes and larger square tabs, the isiheshe. A stunning isiheshe in the Catlin gift (Inside Front Cover) has a black and white striped beaded tab with back fringes in red, white and blue; three long strands of larger beads hang from each side of the tab, ending in a cluster of small brass bells which gave out a musical jingle when the wearer walked. At puberty, the young girl adorned herself with a red or blue cloth extending from waist to mid-thigh and decorated with beads, the utshodo. Young unmarried men often wore the utshodo of their future brides around their heads, according to Mayr. designs of diamonds, chevrons and zigzags. A knowledge of the local color code used in the beadwork is necessary before one can read the message in the tabs and strings. Regina Twala did field work in 1948 on the cipher and colors used in beadwork by the Emangwaneni tribes of the Bergville district of Natal, but her interpretation of the color codes often contradicts that of Rev. Mayr who also wrote from personal observation in 1907. Mayr, however, did not record from which groups of Zulu he drew his information; he seems to have assumed that the color symbolismwas standard throughout the Zulu world and stated that "... the actual pattern does not appear to have any defined significance; it is rather the succession of the color and the relative amounts of the colors, that express the tenor of themessage." I Twala, however, felt that the interpretation of the colors varied with the pattern. Also, according to Mayr the border was merely decorative and the beaded string the most important message bearer, while Twala believed that the main message was in the tab. Regional variations and the difference in the dates of investigation are very likely responsible for these discrepancies. Despite apparent general similarities in meanings of colors, accurate interpretations can be made only by one who knows the exact local origin of the love letter and the color code peculiar to that place. Unfortunately, lacking a more specific provenance than the vast Transvaal, the color code to the pieces in the Fleming Museum must be considered lost. or magical grounds, or both. Beads could also represent the rejection of a lover, as in the case of the inkakane, beads whose royal blue color symbolized a wandering, noisy bird. A young man whose lover had offended him would have his sister make the strand which would be given to his erring sweetheart on the eve of a public event. Beads presented at such a time obliged the receiver to wear them at the ceremony and thus display her lover's rebuke to all. The greatest attention was paid to beaded body ornamentation by those between the ages of fourteen and forty. Young people bedecked themselves lavishly for courtship and dancing. When a girl accepted a marriage proposal, she gave her sweetheart a string of white beads symbolizing her purity, and before the marriage all the girls in her age group would gather to make quantities of beadwork for her "trousseau." On the day of the wedding dances, the bride dressed in her finest beadwork, including many thick fiber tubes covered with beaded coils called imibijo or imigonqo-lozi, worn over the arms and shoulders and around the neck. She would also wear a bead-fringed headdress. The Catlin collection contains many fine imibijo worked in stripes and patterns (Fig. 2), as well as a headband studded with brass buttons and fringed with two veil-like clusters of white looped beads, very possibly a bridal headdress (Fig. 1). Except for special occasions, married men and women wore little beadwork. When men attained warrior rank, their personal adornment changed from beaded to feather ornamentation. A married woman often wore a simple necklet of white beads and little wooden pieces from the fragrant Umtomboti tree (Fig. 6). Black beads in quantity were a sign of the wearer's widowhood. Widows also wore necklets to indicate whether or not they were interested in remarrying. An unusual example in the Catlin gift is a predominantly black, tubular neckpiece with some patches of white (Fig. 7). Hanging in the center are four brass rings beaded in black, but with contrasting center sections of red beads in two rings, and blue beads in the other two. This message of the piece may bethat the widow's eyes are red with weeping (red beads) but that she is amenable to a new love (white and blue beads). 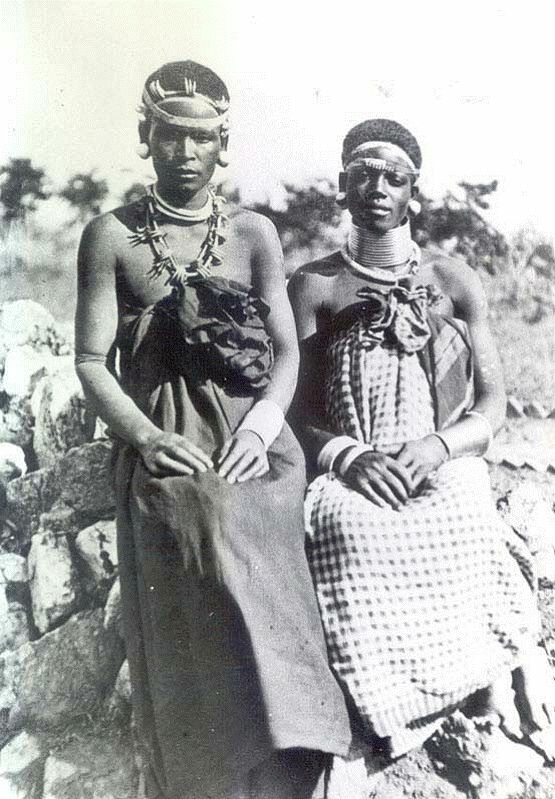 the collection, and may have been worn by a member of the Zulu royal house. The Catlin gift dominates the Fleming Museum's collection of beadwork, not only due to its impressive quality but also to its sheer superiority in number. While Director of Agriculture for Mozambique, Portuguese East Africa from 1908 to 1910, Otis Warren Barrett made a 1300 mile trip through Zulu country in southern Mozambique, where he collected the beadwork later donated to the Fleming Museum. There are several very fine pieces: an animal skin headband covered with cowry shells, sewn with sinew thread and with leather strips for a tie closure- an older type of ornamentation; a small bracelet of twisted copper and metal wire with interwoven bands of pink and green beadwork which distinguishes it from theplain twisted-wire bracelets usually worn; and an exquisitely delicate hair ornament made of a thin, curved skewer of bone. This ornament is wrapped for half its length in fine wire; hanging from the wrapped wire are long strands of fine wire strung with tiny red, white and blue beads. When worn, the beaded wires shimmer and tremble in response to the slightest movement of the body or head. The most recent acquisition to the Museum's beadwork collection remains mysterious as to provenance. About a dozen pieces similar in color, design and manufacture technique were given by Julia Kellogg of Vermont, who had missionary friends in South Africa. The beadwork was sent to her by one of these friends somewhere in South Africa, probably after 1910.
subsidiary to these foreign extraneous objects. Although the designs are simple and the colors monotonously limited to blue and white, technically these pieces represent the apogee of Zulu beadwork. The virtuosity in stringing is surpassed only by the superb Catlin necklace. But this technical excellence marks the final stage in the development of Zulu beadwork. 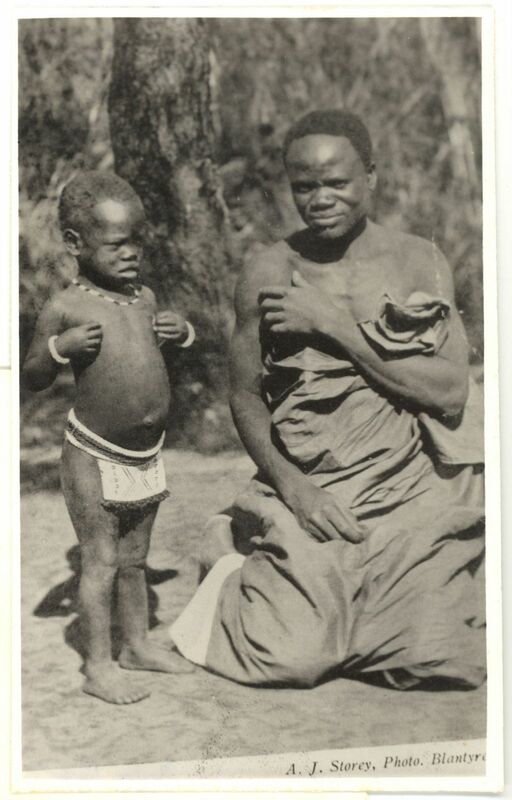 Increasing European influences in all aspects of Zulu life, the political and military upheavals of the nineteenth century, the introduction of more standardized beads and ready-made imported necklaces of the twentieth century, irrevocably changed the character of this traditional art. The forces of life that motivated the creation and wearing of beaded ornaments changed direction.